Refurbishment of Unicorn Primary School, which occupies a large detached Victorian house oppose Kew Gardens in West London. The brief for this school was to rejuvenate spaces within the existing Victorian building and to help define the school’s contemporary identity. This was achieved by installing a series of new linings, precisely arranged, within the existing classrooms. These linings created new volumes – ‘new rooms’ – within the existing spaces. 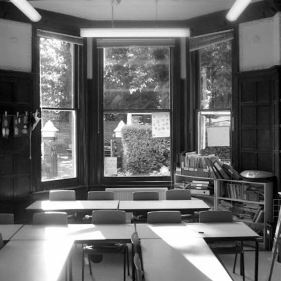 By incorporating display space, white boards and even clocks into these new linings, we created classrooms that are spacious, airy and uncluttered, without simply ‘wallpapering over’ the historic fabric of the school.